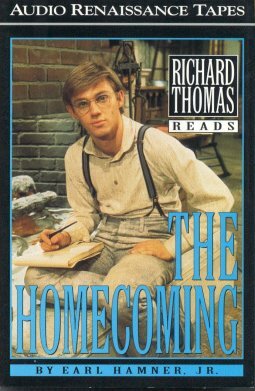 From the Audio Renaissance Tapes, Richard Thomas reads The Homecoming, a novel by Earl Hamner, Jr. Richard Thomas, a veteran of 35 years in entertainment, is one of America's most highly-gifted, versatile, and respected actors. In addition to his Emmy Award-winning portrayal of John-Boy on The Waltons, he has also appeared in dozens of television movies, feature films, and theatrical productions. The audio tape was produced in 1995. Mentioned in The Deed s1/e20 when Cissy Brubaker tells John-Boy that she grew up in the town. Her father owned the livery stable. Both were staying at Mrs. Vandenberg's Boarding House in Wheeling, West Virginia. The town about six miles from Walton's Mountain s2/e14. Farm where a wounded bear killed in calf. The ruins of the site where Roan Walton first built a log cabin, the original Walton to settle the Mountain. The telephone number of the cab company is "257"
Jason auditions and wins amateur contest at theatre in s1/e24 with marquee "Giant Amateur Contest Saturday March 24"
In real life, Richmond is the capital city of Virginia, about two hours east of Charlottesville. Sign in front of house: "Mrs. Vandenberg's Boarding House -- Rooms by week or month"
In reality, the web site http://richmondspiders.ocsn.com/school-bio/rich-school-bio.html of The University of Richmond, once called Richmond College, says, "Earl Hamner, creator of the television show "The Waltons," attended Richmond College in the 1940s. The college John Boy Walton attended, Boatwright University, is based on Richmond College." Also, if you go to http://www.richmond.edu/about/history/, you will find out why Earl Hamner may have used the name "Boatwright" for the name of his college. House of Sally Ann, and younger brother (Buber) and sister (Louann). Retail shop next to hotel in Westham. Fluvanna County is located east of Nelson County and northeast of Buckingham County.